Despite a sensational 1904 season in which he won 14 straight games and set modern records with 41 wins and 48 complete games, Jack Chesbro is best remembered for the wild pitch he tossed to score Boston’s pennant-clinching run on the final day of the season. Broad-shouldered with a sandy complexion, Chesbro normally carried 180 pounds on his 5’9” frame. Before mastering the spitball, he relied on an excellent fastball, which he delivered with a straight-over-the-top motion. After starring for amateur teams, Chesbro and three other locals, including future big-league teammate Art Madison, moved to Middletown, New York in 1894 to play for the Asylums, a team representing the state mental hospital. While he did work with patients, his primary purpose was to pitch for the ball club. His pitching skills were honed by Asylums catcher Pat McGreevy who, noting Chesbro’s long fingers, predicted great success for the pitcher. Chesbro also acquired the nickname “Happy Jack” while working at the hospital after a patient noted his cheery disposition and friendly grin. Joining the professional ranks with Albany of the New York State League in 1895, Chesbro went 5-1 before the club folded on May 20. He joined Johnstown of the same loop and went 2-9 before the league itself folded on July 6. He then hooked on with Springfield of the Eastern League, but was released after seven games. Despite a 3-0 record, he allowed 23 walks and 34 hits with only seven strikeouts in 33 innings. He then pitched semipro ball in Cooperstown, New York. In 1896, Chesbro started the season with Roanoke of the Virginia League. Though that club folded on August 20, Chesbro had last pitched for them June 22 finishing with a 7-11 record. He then spent the remainder of the summer pitching in Cooperstown. Chesbro signed with Richmond of the Atlantic League in 1897. He was 16-18 then went 23-15 in 1898 en route to the league championship. At season's end, he was drafted by Baltimore's Ned Hanlon, but Hanlon moved to Brooklyn, Baltimore was nearly contracted and Chesbro never signed. Back with Richmond in 1899, he began the season 17-4 before being sold on July 7 to Pittsburgh for $1,500. He posted a sub-par 6-9 record with 59 walks and 28 strikeouts. On December 8, 1899 Chesbro, Paddy Fox, Art Madison, John O’Brien, and cash were traded to Louisville for 12 players, including Honus Wagner. The Louisville club was dissolved with Chesbro and the three others assigned to Pittsburgh in March as the NL reduced from 12 to eight teams. With just half a season of major-league experience under his belt, Chesbro refused to accompany the team south for spring training in 1900, though he later reported for duty. His absence from spring training and threats to retire would become an almost annual event. He improved to 15-13 with a second-place club in 1900 then was 21-10 in 1901 and 28-6 in 1902, pacing the league in shutouts each year for pennant winners. He also led the National League in wins and winning percentage in 1902. Before the 1902 season ended, word had spread that Chesbro had already signed to jump to the American League in 1903. He was not allowed to participate in a postseason series of games at the Pittsburgh ballpark in which the players split the receipts. Weeks later he took part in an all-star tour of the west coast. Pitching against Sacramento December 13, he took a 13-1 beating as he watched his opponent, Elmer Stricklett, hold the all-stars to three hits off a newly-developed spitball. Chesbro was declared property of the New York American League franchise under the major-league peace agreement of 1903. 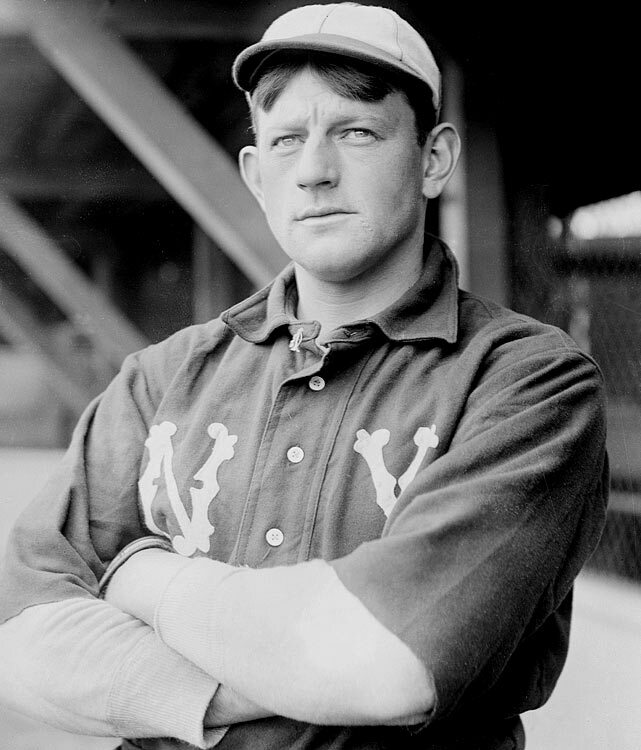 Though the press referred to the team as the “Greater New Yorks” and “Highlanders,” this was the beginning of the storied Yankees franchise and Chesbro would be their first great pitcher. Because Chesbro did not report to the team until April 1, he missed a spring training series in which New York faced Stricklett, who was now with New Orleans. Nonetheless, he led fourth-place New York to a 21-15 mark. He reported earlier the next spring. Though Stricklett was now property of the White Sox, their paths would cross. After playing an exhibition series with Chicago, New Orleans requested the loan of a pitcher for their next series against New York. When Stricklett became the pitcher on loan, Chesbro studied how the spitter was thrown and set out to master it. New York manager Clark Griffith disliked the spitball, and catcher Jim McGuire didn’t like catching it. After beginning 1904 at 4-3 through May 7, McGuire agreed to catch the spitter, and Chesbro was given permission to use the wet one as his primary weapon. He won his next 14 starts. Becoming an amazing workhorse, Chesbro would complete 48 of his 51 starts and relieve in four others while amassing a staggering 454 2/3 innings pitched. Twenty-eight of his starts were with less than three days of rest. While the spitter is usually cited as the main reason for his remarkable season, Chesbro also began using another pitch. He developed a “slow ball,” which McGuire and umpire Bill Carpenter said was the best they had ever seen. He had also reported to camp weighing 163 pounds as opposed to his usual 180. New York trailed Boston by a half-game entering a five-game season-ending series against Boston. The original schedule called for four games, but New York owner Frank Farrell rented his ballpark to Columbia University for a football game. Boston willingly accepted the offer to transfer the October 8 game to Boston, which also allowed the clubs to make up a rainout from June 29. Pitching on two days’ rest, Chesbro beat Boston for his 41st win to put New York a half-game up with four to play. Griffith’s plan was to have Chesbro remain in New York to rest for the double-header on the final day, October 10. However, Chesbro showed up at the train station with the approval of Farrell. He talked his way into a start with no days’ rest and was knocked out of the box for only the third time all season as New York suffered a 13-2 loss. Cy Young hurled a 1-0 shutout in the second game to put Boston up by a game and a half with two to play. New York would need to sweep on the final day to take the flag. In the final-day showdown, Chesbro started the first game. Making his eighth start in 15 days, he had a 2-0 shutout through six innings. The game was halted when he came to bat in the third inning so friends from North Adams could present him with a fur coat and hat. When play resumed he promptly tripled for one of his two hits on the day. Aided by two errors, Boston scored twice in the seventh to tie. Lou Criger led off the Boston ninth with a single and advanced to third on two outs. With a 2-2 count on Freddy Parent, Chesbro made his famous wild pitch scoring Criger. Though Parent singled on the next pitch, Chesbro would be remembered as the man who lost the pennant on a wild pitch. Bill Dinneen held New York in the bottom half as Boston clinched the pennant. The gravity of the wild pitch was magnified when Ambrose Puttmann blanked Boston in the second game. Chesbro talked of retiring during the offseason, then weeks later claimed he had developed a new pitch that would revolutionize baseball in 1905. Calling it the jump ball, he claimed it was different from the riser, because it took an abrupt jump rather than a steady rise. He declared he would take one tour around the league before using it as he had yet to master it. He was so confident of his new pitch that he revealed the secret of throwing the spitter. His tour around the league was derailed by three weeks of inactivity due to a sore arm. Chesbro denied the problem was the spitball despite arm miseries of other pitchers who had adopted the wet one. Upon switching to the spitball almost exclusively, Chesbro had changed his delivery from over-the-top to a round-house fling. He also stayed north during spring training to coach Harvard and reported to New York weighing 200 pounds. Regardless, he claimed his trouble was due to malarial fever developed from the cold he caught while pitching in the rain on opening day. After struggling to a 19-15 record in 1905, Chesbro decided to forego coaching Harvard in order to report to spring training on time in 1906. He won 23 games but lost 17 and led the league in earned runs allowed. When his contract for 1907 arrived in the mail, he mailed back his intention to retire to tend to his business interests. He had bought a farm in Conway, Massachusetts at the turn of the century. He also owned a sawmill and timber land. He was making more money on the farm than on the ballfield. In March Chesbro said he’d sign for the same salary as 1906, citing a figure of $8,500. However, that would have given him a hefty raise. Two weeks into the season, he sought out Griffith at the Boston hotel and signed a deal. Griffith left coach/catcher McGuire with Chesbro with orders for them to report to the club in a week. Chesbro was a mediocre 10-10 in 1907 followed by a 14-20 mark for a last-place club in 1908. Amid rumors he was to be farmed to Indianapolis in 1909, he said he would retire rather than be disgraced. He skipped spring training and refused to report to New York causing the National Commission to place him on the ineligible list. He was reinstated May 24, but he was out of shape. One newspaper described him as being “decidedly fat”. After making only nine appearances with an 0-4 record, Chesbro was waived September 11 to the Boston Red Sox. Under the terms of the agreement, Boston had until May 1 of the following year to decide whether to keep him or return him to New York. He made just one appearance for Boston, losing to New York in the season finale. It would be his last major-league game. The Red Sox announced in January 1910 that Chesbro would be returned. New York had no plans for him on the major-league roster, but he would not report to the minors, which again caused him to be placed on the ineligible list. He stayed on his farm and pitched nearby semipro Whitinsville to a championship. Chesbro coached Massachusetts Agricultural College (now the University of Massachusetts) in 1911 and continued to pitch for semipro clubs. He met with New York owner Farrell and new manager Harry Wolverton about a comeback in 1912. Wolverton agreed to take a look at him, but before leaving for camp he reconsidered and released Chesbro. Wolverton felt he had enough prospects and was not a believer in comebacks. Deciding to pay his own way to Hot Springs, Chesbro thought he could catch on with another club. The National Commission granted his request for reinstatement as a free agent. He worked out with Brooklyn and Pittsburgh, but both passed on him. He returned to Conway and continued to pitch and coach semipro teams. He was still making occasional mop-up appearances at age 53 in 1927 for South Deerfield, Massachusetts. Chesbro pitched from a big-league mound one last time September 11, 1922 at Braves Field, tossing a couple of innings in an old-timers game sponsored by the Boston Post to benefit Boston Children’s Hospital. Old friend Clark Griffith signed him as a coach with the Washington Senators in 1924. However, when Al Schacht was hired June 1 to be reunited with coach and fellow clown Nick Altrock, Chesbro and Ben Egan were trimmed from the coaching staff. Chesbro was out of organized baseball for good. Jack Chesbro died November 6, 1931 on his Conway chicken farm. He had climbed a hill to determine the problem with a water pipeline when he succumbed to a heart attack. He is buried in Conway’s Howland Cemetery. He was survived by his wife, the former Mabel Shuttleworth, a Conway resident he had married in 1896. The couple had no children. In The Politics of Glory, Bill James illustrated how Chesbro’s career numbers (198-132 W/L, 2.68 ERA) were similar, and probably poorer, than his Pittsburgh teammates Sam Leever (194-100, 2.47), Deacon Phillippe (189-109, 2.59), and Jesse Tannehill (197-117, 2.80.) Primarily on the basis of one fantastic season, Chesbro is the only one of the quartet to receive baseball’s highest honor -- election to the Hall of Fame. He was selected by the Old-Timers Committee in 1946. The wild pitch haunted Chesbro for the remainder of his life. Despite his remarkable season, he was constantly asked about the pitch that lost the pennant. Years later, Clark Griffith blamed Red Kleinow for missing the pitch, which he claimed passed the 5’7” Parent about neck high. Kleinow, who had become the regular catcher partially due to Jim McGuire’s trouble handling the spitter, had died in 1929 and apparently never publicly commented on the issue. Shortstop Kid Elberfeld said that Kleinow could not have caught the pitch with a crab net. Contemporary accounts indicate the ball sailed high over Kleinow’s head and struck the press stand on the fly. Chesbro’s widow produced numerous articles and letters in 1939 indicating the wild pitch should have been scored a passed ball. When the New York Journal-American published her story, she considered the matter closed and her husband vindicated. An updated version of this biography is included in "20-Game Losers" (SABR, 2017), edited by Bill Nowlin and Emmet R. Nowlin. It was originally published in "Deadball Stars of the American League" (Potomac Books, 2006), edited by David Jones. Chesbro, John S., Sr.; (grandnephew); Oct. 24, 2004.